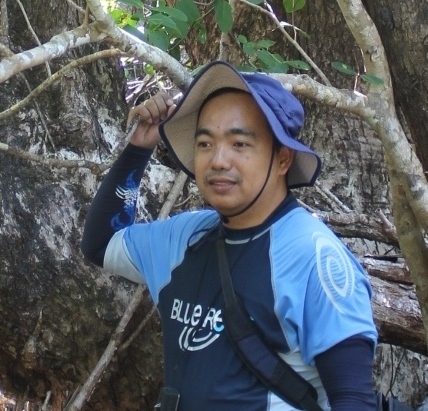 Severino G. Salmo III, Ph.D.
Sev is a restoration ecologist doing research on the effects of disturbance as well as post-disturbance regeneration in mangroves. The current research sites are in Pangasinan, Zambales, Subic Bay, Manila Bay, Mindoro, Palawan, Aklan, Bohol, Cebu and Leyte. Eunice is a graduate student currently taking up MS Marine Science, with a specialization in Biology, at the University of the Philippines Diliman. She obtained her Bachelor’s degree in Biology from University of the Philippines Baguio. She is interested in the biology of mangroves, its goods and ecosystem services specifically the “regulatory natural processes” such as carbon sequestration and coastal protection. She will study and develop ecological models that will simulate the impacts of sea level rise in the growth, survival and spatial distribution of mangroves. Carmela is a licensed chemist. She has finished her MSc in Environmental Science from Ateneo de Manila University, with a thesis entitled, “Nutrient Content and Resorption Efficiency as Recovery Indicators in Typhoon-Damaged Mangroves in the Philippines”. She is currently working on the measurement of carbon stocks in mangrove forests along the Verde Island Passage. Vanessa is currently working on her thesis focusing on the use of vegetation and sediment attributes to assess the vulnerability of mangroves to sea-level rise in Silonay, Calapan, Mindoro Oriental. Lara studies mollusc colonisation as indicator of habitat functionality in mangrove-colonised abandoned fishponds in Anda, Pangasinan. She is correlating the changes in mollusc assemblages with the improvements in vegetation and sediment conditions. Lui studies heavy metal retention and resorption of Avicennia marina as a phytoremediation strategy in Lake Uacon, Candelaria, Zambales. He is evaluating the transfer/retention/stabilization of HMs across trees, saplings and seedlings as a phytoremediation strategy that makes mangroves survive in a HM-contaminated environment. Khas is currently working on her thesis focusing on the use of mollusks as bio-indicator of contamination in mangrove sediments in Lake Uacon, Candelaria, Zambales. Hannah evaluates the role of N and P in either facilitating or limiting the carbon sequestration capabilities of mangrove forests that have recolonized abandoned fish ponds. The study will provide insights on the need to rehabilitate abandoned fish ponds by demonstrating its potential to recover the carbon sequestration ecosystem service to complement mangrove restoration programs. This website is dedicated to the advancement of mangrove research in the Philippines. We collaborate with various stakeholders – local and international - to document and enhance our understanding of Philippine mangrove biodiversity. We also study the role of mangrove ecosystem health (as disturbed, restored and intact) in the vulnerability, adaptability (through sequestration of atmospheric CO2), and resiliency of mangroves against sea level rise.